Hope You Had A Wonderful 2010 And That You Have A Great 2011! Happy New Year! It has been an amazing year this year, with a lot of twists and turns at our house. We were dealing with a tough pregnancy, and then a tough birth of our new son. And now we're getting to experience life as parents as well! It's been a lot of fun. Now the new year is coming on, and with it new challenges, but also the hope of rebirth and fresh starts. So let's all take that opportunity to make this next year the best one ever! provisions in the bill could be bad news for homeowners interested in remodeling projects to conserve energy next year. The legislation slashed the popular tax credits for energy-efficient remodeling from 30% of an improvement’s cost ($1,500 maximum per taxpayer) to just a 10% credit with a $500 maximum for expenditures on insulation materials, exterior windows and storm doors, skylights, and metal and asphalt roofs that resist heat gain. The home improvement tax credit we've had for the past 2 years allowed homeowners to claim up to 30% of cost of the home improvement, up to $1,500. The amount of that credit is substantial enough that a lot of people were deciding to finally upgrade old windows or doors – $1500 was just too much to pass up. That tax credit is expiring on December 31st, 2010 (so act this week if you want in!). The tax cut package passed last week passed a new version of the tax credit for 2011, but the amounts have been reduced. Here are the details. Eligibility: Must be on an existing home & your principal residence. New construction and rentals don’t qualify. Reduced max credits: Some items have reduced maximum tax credits now as well. Details below. So you can receive at most a home improvement tax credit of $500. If you've already received credits totaling $500 or more from 2005-2010, you aren't able to claim the credit in 2011. What Products Are Eligible For The 2011 Home Improvement Tax Credit? Water Heaters. Credit includes installation costs; some restrictions for energy efficiency apply. $300 max credit. HVAC components, including advanced air handlers, air force heat pumps, central A/C units, boilers, propane, and gas furnaces. Tax credits include installation costs. $300 limit, and furnaces must now be 95% efficient. Biomass Stoves. $300 credit limit. Metal and asphalt roofs. Credit doesn’t include installation costs. According to the government site, some of the tax credits allow you to claim installation costs, while other credits do not. To find out if your product is included, and whether you can include installation costs, check the government site here. To claim the energy efficient products tax credit, you’ll need to claim the credit on your 2011 taxes in 2012. There will be a form from the IRS to send in with your return. (I’ll update with a link once it becomes available). The product has to be placed in service in 2011. 2011 Federal Income Tax Brackets for your reference. Willl People Still Take Advantage Of The Credit? The tax credits have been greatly reduced for many products. For example, if you replaced your windows last year, you may have been able to claim the full $1500 credit. This year, you'd be maxed out at $200. That's quite a drop. Will that mean that less people go out to buy these energy efficient home products? Most likely. To me that really reduced the effectiveness and the reason for the credit. Why even have it if it doesn't have a stimulus effect? A lot of building industry folks aren’t happy about the reduction in the credit either. What are your thoughts about the reduction in the amount of the credit? Do you think it will have a negative effect on home remodelers, contractors and other building trades? Tell us your thoughts in the comments. This past week the Congress passed the Tax Relief, Unemployment Insurance Reauthorization, and Job Creation Act of 2010. The tax package was designed to extend the Bush era tax rates for another 2 years, in addition to extending unemployment benefits, lowering the estate tax and other smaller measures. This means that the 2011 federal income tax brackets will remain essentially unchanged. A few new tax measures were created in addition to extending the current rates, however. Among them was the 2011 payroll tax holiday. One measure that President Obama wanted to pass as a replacement to the expiring Making Work Pay tax credit that was enacted in 2009 is the new 1 year 2011 payroll tax holiday. The payroll tax, or FICA portion of your paycheck tax withholding – which funds Social Security and Medicare, will be cut by 2% for 2011. The withholding rates for your Social Security taxes will go from 6.2% to 4.2% for the 2011 tax year. The other 1.45% of your FICA taxes go to Medicare funding, and will remain unchanged. What does that mean for the average taxpayer? Around a $1000 tax savings. Since the Social Security tax is capped at $106,800, the maximum savings that could be seen by a higher income individual is around $2136. This as opposed to a $400 credit for singles and $800 credit for families under the “Making Work Pay” tax credit. When Will I See The Extra 2% In My Paycheck? Typically the payroll tax is taken care of by your employer or the company that processes your payroll. You as the employee shouldn't need to take any action – like filling out a W4 withholding form. New withholding tables have been released by the IRS now, so most employers will begin updating their own tables soon. Since the legislation was passed so late in the year, employers will have until 1/31/2011 to put in place the new payroll tax rate of 4.2%, and make any adjustments or corrections by 3/31/2011. So you should starting seeing it shortly after the new year. If you haven't seen the changes in your paycheck byFebruary, you may want to ask your HR department when the change will be happening. I just wanted to wish everyone a Merry Christmas! Thank you for reading my lowly blog this year as we've grown from nothing to the point where we've got thousands of page views every month. I couldn't have done it without you all, and I'm so thankful for every one of you in this Christmas season. Things may be a bit dead around here for the next few days as we celebrate with family, but I hope that you and yours have a blessed holiday. God bless! From time to time I get questions about blogging from friends and family members. They know I've started a couple of blogs and made them somewhat successful, and they want to know how they might go about setting up their own successful sites. At this point I usually start talking to them about how much work it is to blog, how you have to constantly be writing content, promoting the site, networking and researching SEO. After I've been talking to them about this for a few minutes usually their eyes start to glaze over, and they begin to realize that making a blog successful isn't an going to be an easy project. Most of them ditch the idea before they even get started. To me that's a big mistake because starting a blog, while it is a lot of hard work, can also be extremely rewarding – both monetarily and in other ways. Once they've heard just how hard blogging can be, they often move on to the question of how I can afford to spend so much time doing something that is essentially just a hobby in their mind. At this point I have to explain how I started blogging as a hobby, but after a year or so of constant effort I realized that it could be so much more. Blogging has the potential to become a nice side income, and if you work especially hard and have a bit of luck – you can turn it into a full time income. Because of that I started to treat my blogging more as a business. I think without that added benefit of being able to make quite a bit of money from blogging, I may have stopped writing quite some time ago. While I haven't matched my day job income yet from my blog, I am blessed to say that it has been enough to replace my wife's day job income so that she could stay home with our son that was born 5 months ago. To me that's huge, having the peace of mind that this extra blogging income creates is priceless. One of the great things about launching a blog is that it has almost zero startup costs, but has the potential to make quite a bit of money. What costs can you expect to incur right at the beginning? Domain name: You can usually find a domain name for anywhere from $7-10 a year. That's dirt cheap. Hosting: You can find a cut rate hosting plan for about $5-10/month. That's only a few cups of coffee! I'm on a higher tier plan now with Media Temple, and that costs closer to $30/month. 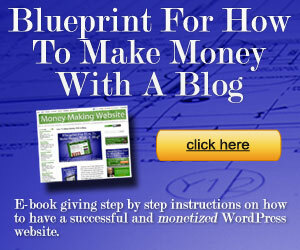 WordPress: The standard for blogging software, the self hosted version of WordPress is actually a free product! WordPress theme: You can find a ton of free themes to start with (which I recommend), but premium themes like Thesis, Genesis, Catalyst or Headway will cost you anywhere from $70-165. Those are the main things you'll need to pay for. So for anywhere from $67-$200+/yr you can start your own money making business. That's not a bad deal! I actually started another site last weekend. In about 1 hour I bought a domain name, added the domain to my hosting account, installed WordPress and the Thesis theme. Now it's up and running and being indexed by Google! Once you have done it a couple of times, setting up a new site is a breeze! To me the biggest cost that there is related to blogging is the free time you'll lose to writing content, promoting your site, getting backlinks, tweaking your site, networking, engaging in social media, etc. There are endless tasks to perform with a blog, and if you don't enjoy it, you could burn out pretty quick. For me I would probably have blogged as a hobby anyway, and doing it for money just made it all the more attractive. I don't mind spending 20-30 hours a week on my sites because I actually enjoy the entire process. For others it might be more of a chore. Make sure you go in with eyes wide open. Making money with a blog isn't easy, and it takes time. In order to make real money, you'll need to start building up content, get plenty of backlinks by participating in carnivals and writing for article sites, guest posting and a variety of other things. As a general rule, however, if you do everything the right way, you can probably expect to be making at least something by your 5th or 6th month. My first site didn't take off until the 6th month, and at that point it's been a money maker ever since. This site you're reading this post on started making money it's second month because I already had some contacts to sell advertising to from my other sites. So what are some of the biggest sources of income for some of the bigger sites? Google Adsense: by far the biggest. to do well with adsense you have to write about the right topics though. Check out other successful sites to see what they write about. I suggest adding Adsense right away, better to have the ads there from the start, and possibly make some money! CPM ads: If you can find a premium ad network that will accept you – and if you have enough traffic, CPM ads can pay pretty well. Direct sold banner ads: If you can sell ad banners directly, it can do pretty well. The key is finding people who want them. Affiliate sites: sites like shareasale, flexoffers.com, linkshare.com and a variety of credit card sites do pretty well for me as well. Promoting these works best with posts usually -reviews/etc. Banners in the sidebars don't tend to do as well. Your own info products: If you can come up with an ebook or other info product that people are willing to pay for, you'll have a nice source of recurring income. Get paid to sites: If you have a blog it's a good place to promote “get paid to” sites like cashcrate.com, swagbucks, ebates and others that will pay you for referrals. Paid posting: I have become a staff writer at a couple of places in exchange for payment for each article. Usually in the range of $10-75 /article depending upon how long you've been blogging and the quality of your work. Use your blog as a launching pad to write a book: I haven't done this, but I know of several bloggers who used their site as a means to write and publish a book. What it really comes down to is that your income opportunities are only as limited as your imagination! I won't go in depth in this post as far as step by step instructions on starting a blog, but here are a few tips for things I've learned about blogging. Less is sometimes more: I've found that my adsense ads do better when i have fewer ad placements on a page. I put one or two ads in a well placed location, and it tends to do better than say 3 ads on the page. Do your research: take the time to do some research as to what the popular and newsworthy items of the day are. Write about those things because people are searching for them. Do your keyword research. Content is king: having good content is key. The more you write, the more content that you have that gets indexed by google – and the more chances you have for coming up in the search engines. Do blog carnivals: participate in blog carnivals, they're free backlinks, and backlinks are like gold. Don't expect huge money right away, it takes time: I think it was 6 or more months before i made any real money. Have patience, it will come. Network with other bloggers and help each other: Sometimes blogging may feel competitive, but actually it's more of a team challenge. If you can cooperate, give each other links and promote each other's content -you all win. So there's my brief intro into blogging as a business. I'll probably be writing more about this in the coming weeks. In the meantime, however, if you're interested in starting a blog, here's a comprehensive ebook on how to make money with a blog. Have your own blogging tips, or questions that you'd like answered? Tell us your thoughts in the comments! 2011 Marginal Tax Rates: Will We Keep The Same Rates, Or Will Taxes Go Up? The last few months we've had quite a bit of uncertainty when it comes to what will happen to our 2011 marginal tax rates. The Congress and President Obama have gone back and forth trying to work out a deal on extending the current tax rates. First there was no consensus on whether they would extend them for all taxpayers, or only some. Republicans wanted them extended for everyone, while the Democrats wanted them extended for everyone except high income individuals. After the election at the beginning of November, however, President Obama took on a decidedly different tone when it came to the tax rate extensions. His party had lost power in the House, and he was now more open to a compromise to get something done. He doesn't want to risk having the rates go up on the middle class and poor, and admits that raising the rates while our economy is down like it is – wouldn't be the course he'd want to take. Extend Bush tax cuts for everyone, for 2 years. Reduce Social Security tax levied on a worker’s wages from 6.2% to 4.2% for one year. Extension of jobless benefits for long term unemployed for another 13 months. Extend current tax rates on capital gains and dividends for two years, including for higher earners. Where Is The Tax Cut Package Now? As of this week the tax cut package is still working it's way through Congress. Yesterday the Senate passed the package overwhelmingly, and it now moves on to the House. The Senate approved a controversial $858 billion tax cut package Wednesday, overwhelmingly voting to extend the Bush-era tax reductions despite a series of objections from both the left and the right. The measure passed 81-19 to advance to the House of Representatives, which will take it up on Thursday, according to Majority Leader Steny Hoyer, D-Maryland. So one of the key hurdles, passage in the Senate, has now been cleared.The problem? In the House some of the Democrats have threatened to change certain provisions of the bill that they don't like, which could derail the compromise. A number of House Democrats, including Speaker Nancy Pelosi, D-California, want to change the estate tax to levels previously approved in a separate House bill that would exempt inheritances up to $3.5 million and tax amounts above that at a 45% rate. Pelosi said Wednesday the change would bring in an additional $25 billion instead of providing tax protection to only 6,600 more families through the lower rate and higher exemption in the negotiated tax deal. Some moderate Democrats have called for the House to pass the bill unchanged. So now we'll have to wait and see if the measure will be changed, and if so, what that means for hopes of it passing. The House Rules Committee decided Wednesday night to allow a vote on changing the estate tax provision to the levels in the previously passed House bill. If approved, the changed bill would then go back to the Senate. If rejected, the House would then hold a separate vote on the Senate version, with approval sending the bill to Obama. Republicans involved in the negotiations with the White House on the package have warned that any changes by the House could derail the entire proposal, causing tax rates to increase in 2011. So now we wait and see what happens with the bill – if the House votes to change the estate tax provision, and if so, if the Senate will allow the changes. Some have said that such a change could derail the deal, and could mean that marginal tax rates go up on January 1st. We shall see! UPDATE: Sounds like the House passed the bill now as well, 277-148. Both parties contributed almost an equal amount of votes to get it to pass – 139 Dems, 138 Republicans. All that remains now is for the president to sign the extension. What do you think will happen? Will the compromise package be passed, or will changes be made to the package that sends it back to the Senate. Tell us what you think in the comments!